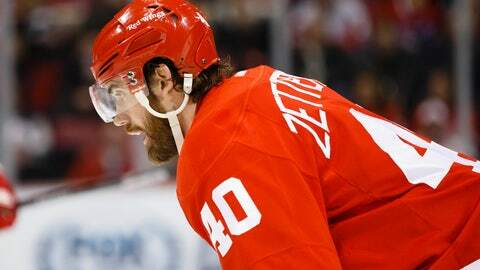 Henrik Zetterberg, a late scratch for Sunday night's game against the Florida Panthers, will not make the trip to Philadelphia. The Red Wings will be without their captain for at least one more game but they do get a couple of players back. Wings general manager Ken Holland told the Free Press that neither Henrik Zetterberg, a late scratch for Sunday night’s game against the Florida Panthers, nor Pavel Datsyuk would make the trip to Philadelphia for Tuesday’s game. After Sunday’s game, coach Mike Babcock said that Zetterberg’s back had flared up again. "You come to the rink hopeful he’s going to play," Babcock said. "Because we didn’t have morning skate we didn’t know. Then we got the news and went from there. We would have liked (Johan) Franzen not to play in the middle his first game back. When you’re a winger and you got go in the middle it’s great when you’ve played and you got tempo and you’re in the kind of game shape you want to be. But that’s part of life." Franzen returned Sunday after missing 16 games with a concussion. Most likely, Franzen won’t have to play center as Joakim Andersson is ready to return from missing six games with a lower-body injury. Datsyuk has not played since the Winter Classic due to a lower-body injury. The Wings are 1-2-1 this season when both Zetterberg and Datsyuk are out of the lineup. There are a couple if items in the good news department. Goaltender Jimmy Howard has recovered enough from tweaking his left knee and is available so the Wings sent Petr Mrazek back to the Grand Rapids Griffins. Mrazek is 1-3-0 with a 1.64 goals-against average and .924 save percentage in seven games with the Wings this season. Gustav Nyquist earned the NHL’s second star of the week by scoring in four straight games. According to team statistician Greg Innis, it is the longest streak by a Red Wing since Daniel Cleary scored in six straight games from Nov. 5-17, 2010. Datsyuk scored in five straight last season but missed one game due to injury in that span.